It must be St Patrick’s Day because there have been quite a few different things spotted with shamrocks on them. Five to be exact. 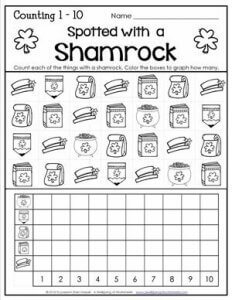 Have your kids count the number of objects and graph how many on the bottom portion of the page. Stay in tune with the day and have them graph in green.